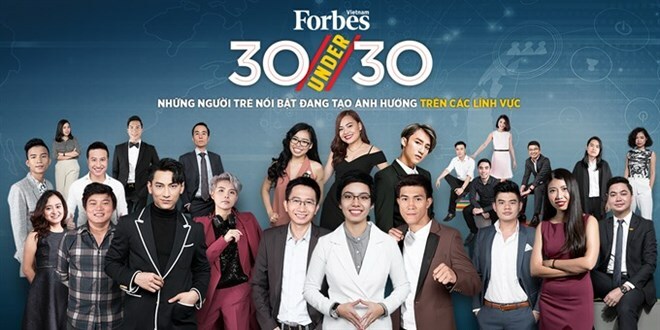 Hanoi (VNA) - Forbes Vietnam magazine announced the “30 Under 30” list earlier this week, featuring some of the brightest young entrepreneurs, innovators and game changers in the country. This is the third time Forbes Vietnam has announced the list to honour young people who have made a positive contribution to different fields. Besides young entrepreneurs and start-up founders who have had noticeable success, this year’s list also features individuals with outstanding achievements in the fields of arts, entertainment, sport, policy and education as well as social activists, such as Son Tung M-TP (24, singer), Nguyen Thi Tuyet Dung (25, soccer player) and Le Nguyen Thien Huong (30, founder of #SaveSonDoong). Scientific researchers also feature in the list for creating breakthroughs in the Industrial Revolution 4.0, such as artificial intelligence and machine learning. They include Pham Thanh Thai (28, doctor, Amazon) and Luong Minh Thang (30, doctor, Google Brain). A survey found that more than 90 percent of the 30 Under 30 youth were college graduates and had higher education, with some 60 percent having studied abroad. While most of them have returned home, some continue to work in foreign countries while contributing to the development of Vietnam. Forbes Vietnam’s 30 Under 30 list was first announced in 2015.